Happy Friday everyone! Sorry for the lack of posts this week- my coworkers and I were in Chicago for a quick few days, which was SO fun! I will post this weekend about it, so stay tuned. But this week's Style Challenge is all about neons baby! And you all know I am obsessed (my motto is the brighter the better) so this one came fairly easy! I must say though, this look is a little more tame than my usual neon outfits, but I like the subtle pops throughout! Gotta make this short and sweet today, but hope you enjoy your weekends! See how Meghan, Carlina, Adiel, Rebecca, and Angie rocked their neontastic looks! That shirt is rad, Amanda! Love your neon look! I love this look! It reminds me a bit of an updated 80s Punky Brooster look! Today's the last day to enter my Giveaway! 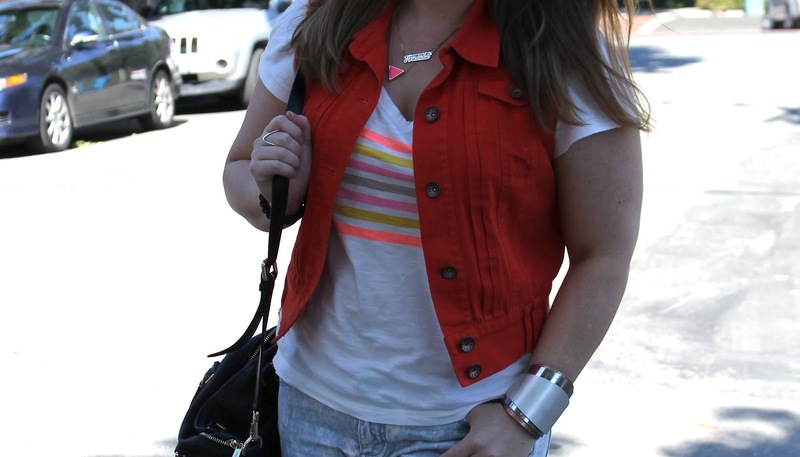 Love that red denim vest! Looking good, gf! Visit MartRing.com where everyday is a Blackfriday. Clearnance deals from top retailers. MartRing.com is the place to find deal posted which are refreshed every hour.